Remember the days when the head-to-head between Federer and Nadal was 23-10 in favor of the Spaniard? When it seemed that he was in Roger's head so much that it didn't appear there was any way to right the ship? I admit that Fedal match still strike some fear in my heart, but who would have ever believed that victories would be 4-0 Federer for 2017, and five in a row all together? 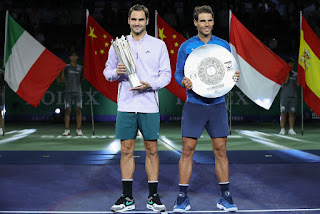 That he would beat him in a major final and two Masters 1000s, in a year that has been equally impressive for both as to the titles they have won? And that by October their H2H would be 23-15? I still have to pinch myself sometimes to believe the happenings of this glorious year for Roger aren't really just a dream. Nadal has been on a roll this fall, winning the US Open and Beijing and looking quite fierce as he moved into the final in Shanghai. In comparison, Federer sustained a back injury in the final of Montreal and then struggled in the US Open before his loss in the quarters. I must say I wondered if his amazing results from the first half of the year were over. However, Roger being Roger, he knew what he needed - time to let his body recover and then proper preparation to get himself into good form. Arriving early in Shanghai he got himself into the tennis form he was hoping for, which improved more and more as the matches went on. By the time he got to the final, in spite of a late match the night before, he knew what he needed to do in order to beat his biggest rival; the same thing he has been doing all year, playing aggressive, hitting glorious FH and BH winners, and serving out of this world. 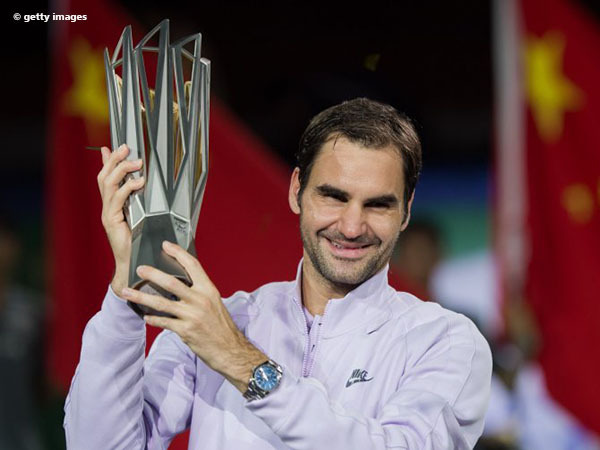 Roger is now tied for second place for number of titles won with Ivan Lendl at 94. Though 109 (Jimmy Connors) still seems a long way off, 100 is certainly getting closer. There are a potential three more tournaments he could play this year. I would think he would play in his home tournament in Basel, but I'm rather hoping he chooses to not play in Paris, though it would get him closer to catching Nadal at #1. However, he has already stated that the ATP finals in London are his priority and for him to be at his best his body needs to be 100%. Can you imagine him capping off this unbelievable year with a win there? 2017 has already been a miracle year for him - that seems an appropriate way to finish it! And I have tickets for all the round robin sessions with my first trip to Europe. London calling!